Use less manpower and move more product! The Punch ’N Gro® is a simple, mobile transplanting system that results in high-speed transplanting. It saves time, is easy to use and gives you perfect plug placement every time. This low-cost, manual system arrives at your greenhouse fully assembled and allows you to use a variety of tray sizes with a variety of crops. Q. What is the Punch ’N Gro? 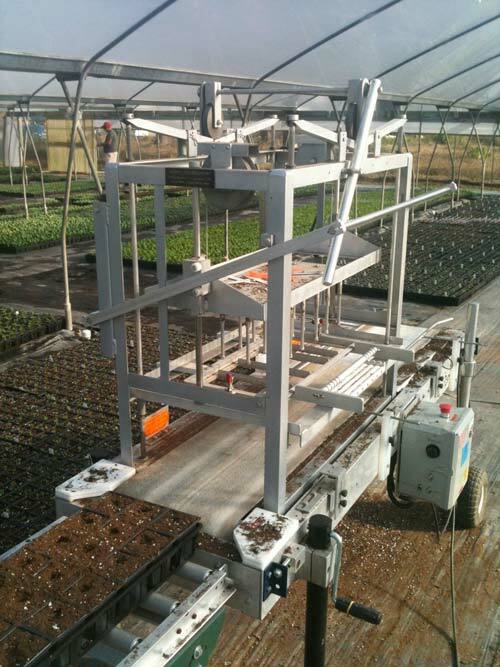 Punch ’N Gro® is a simple transplanting machine requiring no fuel, energy or electricity to operate. It is quite mobile so it can be used anywhere. It uses a specially designed “X-cut” plug tray that enables plugs to be “punched” from the plug tray to the finished flat. Q. What species work with Punch ’N Gro? Punch ’N Gro works on most species of bedding plants. We do not strongly recommend its use with fibrous begonias or coleus. However, we have customers who do use Punch ’N Gro for everything! Q. Will Punch ’N Gro work with my tray size? Several Plug Punchables® plug sizes are available. One of them will work in most 10 x 20-in. or 17 x 17-in. flat configurations. Q. Will Punch ’N Gro work with the soil I use? Most likely — as long as you can easily push your finger into the mix, Punch ’N Gro will push the plug into the mix. With a heavy mix or one with larger bark pieces, it may be necessary to dibble the flat before transplanting. Q. How much does Punch ’N Gro cost? Prices start at $4,280.00 and a complete system ready to use for a 10 x 20-in. flat punching Jumbo 606 cells is $4,515.00 (price subject to change). Contact Ball Seed for the most updated pricing at 800 879-BALL. Q. How many flats will Punch ’N Gro transplant per hour? Most customers report at least a 50% increase in flats transplanted per hour using Punch ’N Gro versus hand transplanting. Many customers report doing 300 to 500 flats per hour with 5 to 6 people on the line. This includes transplanting, patching, labeling and setting the trays on a bench, rack or floor. Q. How many people are needed to operate the Punch ’N Gro? Punch ’N Gro can be operated by as little as one person. Generally, you can expect to transplant at least 50 flats per hour per person for up to five people. Q. Does soil need to be wet or dry? The Punch ’N Gro system works best if the soil mix is on the dry side, but not completely dry. It is best to water the plugs after transplanting. Q. How does the operator align the plugs? There are several, very simple adjustments to align the plugs. A 7/16-in. wrench is all that is needed to make these adjustments. Switching to a new flat configuration takes no more than 10 minutes. Q. Which pattern is used? The locator block on the front of the machine allows the plugs to be aligned properly for each punch. The pattern is different for each flat configuration. An operator can usually “learn” the pattern in a few minutes. Q. Why don’t my plugs go in straight? It is important that the plug tray be gently resting right on top of the finished flat when punched. If there is a gap between the two, it is likely the plugs will not go in straight. Q. Why don’t my plugs go into the middle of the cell? Generally some of the plugs will not be centered in the cell. Growers find that this has no impact on the finished product. In fact, because the plugs are spaced exactly the same from each other and are planted to the exact same depth each time, the finished product is very uniform and attractive in the retail store. Q. How much do the plugs cost? Punch ’N Gro plugs are comparable in price to traditional plugs. The 324 Plug Punchables plug is almost the same price as the standard 288-plug. Q. Can I seed my own Plug Punchables trays? You may buy Plug Punchables trays from Blackmore and grow your own plugs. The license agreement does not allow the resale of these plugs. Contact Blackmore at 800 874-8660 for more information. Q. How much does the plug tray cost? The Plug Punchables plug tray is slightly more expensive than the cost of a traditional plug tray. There is a 10¢ to 15¢ premium on the tray. Q. Do I have to buy the Punch ’N Gro system from Ball Seed? Ball Seed is the exclusive distributor of Plug Punchables. Q. Who sells the plugs? Ball Seed is the exclusive supplier of Plug Punchables. Currently, they are grown at 7 locations in the United States and Canada. Q. Who sells the plug flats? And can I buy the plastic to propagate my own plug trays? Blackmore sells the plug flats. They can be purchased directly from Blackmore Co.
Q. What should I do if my plug tray rack doesn’t go down low enough? The poles on the four corners of the machine can be raised and lowered to accommodate different finished flat heights. This is done by moving the cotter pins to the proper pre-drilled holes to get the desired height. Q. What causes broken plugs? It is important to make sure all the settings are correct. If they are, it is possible the plugs are too mature or too soft. Contact Warren Ida at Tagawa for more information toll-free 877 864-0584. Order your favorite crops as time-saving Plug Punchables™ and Premium Plug Punchables™ Liners. Choose from a full lineup of best-selling varieties, including the most popular standard and premium seed-grown products, plus an extensive listing of the top-performing vegetative items. Plug Punchables are produced by the best suppliers, located strategically across the United States and Canada for the most efficient delivery. Make the most of your Punch ’N Gro system with the Blackmore Power Conveyor. Mount it with your Punch ’N Gro machine in minutes and operate it almost anywhere. The Power Conveyor handles up to 430 flats per hour, with each flat automatically positioned for transplanting. Easy-to-use switches and sensors automatically control the advancing and stopping of the belt. Plus, the Power Conveyor can be interfaced with controls on a tray filler to operate inline as well. For more information about the efficient, cost-effective Blackmore Power Conveyor, contact your Ball Seed Sales Representative or call 800 879-2255.